At 10:50 p.m. on Dec. 8, 1980 in New York City, John Lennon was shot by Mark David Chapman. 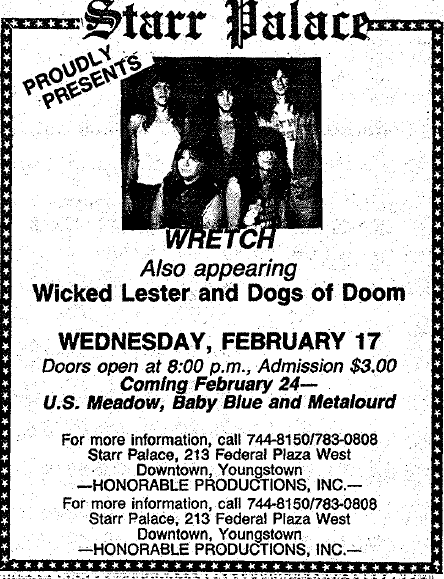 As that tragedy unfolded, The Babys, a British rock group with a few minor hits to their name, were playing a gig at the Youngstown Agora. A comment on a Facebook page dedicated to photos of concerts at the Agora said the band only played an hour and left the stage after playing a cover of “Baby You Can Drive My Car”. The next day at a show in Cincinnati, an overzealous fan pulled singer John Waite off the stage and injured his knee. The band played one more gig in Akron before breaking up for good after roughly a 6 year career. Thanks in part to glorious exposure by MTV, The Police had no trouble playing whatever venue they wanted in the 1980s. The ’70s was a different matter altogether. Even though the band had reasonable success on the radio with the first two albums Outlandos d’Amour and Reggatta de Blanc, big gigs were still a ways off in the distance in the USA. When the band took the stage at the Youngstown Agora on November 11, 1979 they were in the midst of their second tour of the USA, supporting the Reggatta de Blanc album. Throughout 1979 and 1980 the band toured the world over several times with hardly any off time. That sort of grueling touring schedule would continue into the ’80s and lead to the band’s eventual breakup in the middle of the decade. WHAT THE SHOW SOUNDED LIKE: There are any number of FM or soundboard recordings of shows during that tour. I’ve added a page dedicated to mapping where venues mentioned (or will be mentioned) in this blog. You can see the list on that page or you can just follow the link below. Throughout the ’70s, The Tomorrow Club/Agora venue was able to showcase many bands who were on their way to bigger things. 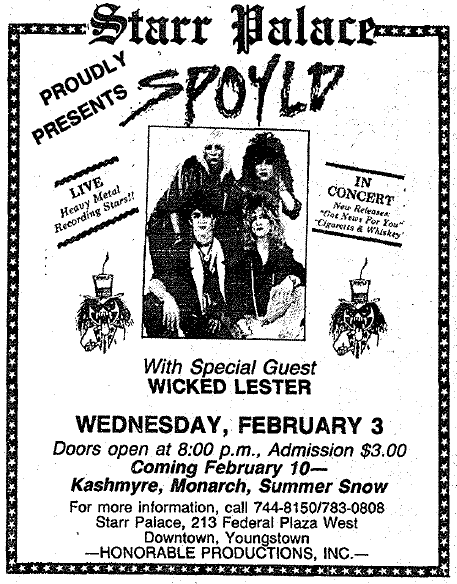 By the time the ’80s hit, there were some bands being booked at the venue who were going on to lesser things. Such is the case of Thin Lizzy‘s visit to the Agora Theater on November 18, 1980. In 1977, Thin Lizzy was a big enough name to be opening a show for Queen at the Richfield Coliseum. In fall of 1980, the band was supporting the Chinatown album which failed to crack the Billboard Top 100. Band leader Phil Lynott was busy swapping new members in and out at that point in the final stage of the band’s career. This would be the last U.S. tour for the original Thin Lizzy. Drugs would claim the life of Lynott in 1986. WHAT THE SHOW LOOKED LIKE: Here is a few snaps of the show someone kindly uploaded to Facebook. Jerry Lee Lewis was fresh off of a 17-hour stay in a Memphis hospital for a bad reaction to “antibiotics he was taking for the flu” when he arrived for an April 6, 1980 gig at the Youngstown Agora. He was in the hospital on Friday and was in Youngstown for the show on Sunday. He would play another show in Akron on Monday. 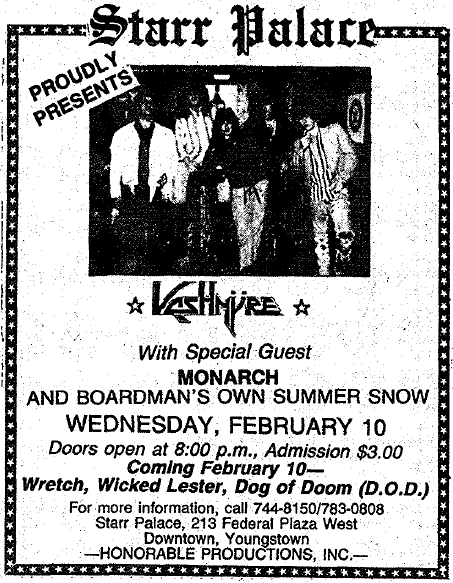 I’d like to say I know for certain that this was the Killer’s first show in Youngstown, but I can’t. There’s a strong possibility he played Stambaugh Auditorium in the ’50s (just like every other big star of the era), but finding information on that has been problematic. WHAT THE SHOW SOUNDED LIKE: Here’s a show from Lyon, France in 1980.